I.D. Flip knives can be opened and closed with one hand. These flip knives can be opened and closed using one hand even if your hands are cold or you are wearing gloves ! They can open and close in either direction so that you can use either hand to operate them. If you are fishing, climbing, or whatever the situation, you can always have one hand free. No adjustments are required for left hand use. The tension screw on the pivot bearing can be adjusted so that the blade flips open easier. Not too loose - the screw will fall out ! Start by holding the flipknife in one hand with your thumb on top and straight inline with the handle and the underside of the handle gripped with the ends of your fingers. Use your thumb to slide the safety catch back. Now lift the locking leg upward with your index finger - squeeze between thumb and index finger and push the blade through and out of the handle to an angle of about 90 degrees. In this position, the tang can be hooked with the same index finger and pulled back until the blade is locked open. 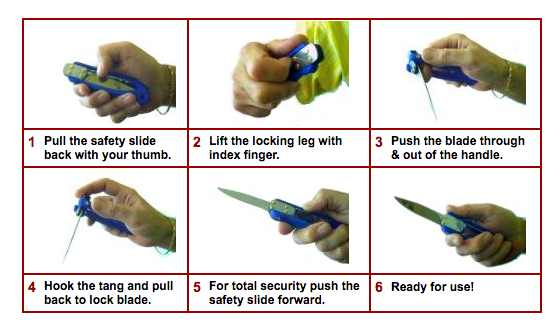 Then slide the safety catch forward towards the blade with your thumb and the flip knife is ready for use. Flip knives can also function without using the safety slide at all and it can be removed but I do not recommend this. To close the flipknife the safety catch is slid back. Then lift the locking leg with the index finger (squeeze between thumb and index finger) at the same time push the tang out of the handle so the lock stays disengaged. Now push the tang with the same index finger to bring the blade into the closed position where the locking leg locks the flip knife closed. The safety catch can be pushed forward to make it child safe and pocket proof. Anyone unfamiliar with your knife will struggle to open it. In practice this works for me with my big hands and is quite easy and fast. Chuck Karwan had a completely different way of opening his flip knives. In fact there are several other methods to open the blade which we hope you will enjoy discovering for yourself, but please be warned to become familiar with the unusual way the knife operates before you try any fancy tricks as we will not be held responsible for any mishaps.